Scott Wedgewood, acquired just two days ago from the New Jersey Devils, will become the fourth goaltender to start for the Coyotes in just 12 games in a so-far winless season when Arizona takes on the Philadelphia Flyers on Monday night in the fourth game of an eight-day, five-game road trip. Wedgewood, 25,was 1-0-0 with a 1.00 goals against average (GAA) and a .973 save percentage with the Binghamton Devils of the American Hockey League this season. He owns a 51-36-9 record with a 2.35 GAA, a .908 save percentage and eight shutouts in 110 career AHL appearances. The 6-foot-2, 195-pound native of Brampton, Ontario, registered a 2-1-1 record with a 1.25 GAA and a .957 save percentage in four career NHL games with the Devils. The Coyotes sent a fifth-round choice in the 2018 draft to New Jersey to acquire him. He was originally drafted by New Jersey in the third round in the 2010 Entry Draft. He follows Louis Domingue, Antti Raanta and Adin Hill in the Coyotes’ parade of goaltenders. Domingue cleared waivers on Monday and was sent to Tucson of the AHL, Hill was sent down to Tucson on Saturday after the Wedgewood trade was completed, and Raanta has been placed on injured reserve while he continues to recover from a lower-body injury that has sidelined him for more than two weeks. Raanta has an 0-1-1 record and 3.33 goals-against average, Domingue is 0-6-0 and 4.33, and Hill is 0-3-0 with a 3.76 GAA. Hunter Miska, 22, was recalled from Tucson to serve as Wedgewood’s backup. Miska, 6-feet-1 and 174 pounds, had a 3-0-0 record, 4.02 goals-against average and an .884 save percentagefor the Roadrunners. He is less than a year removed from leading Minnesota-Duluth to the NCAA Frozen Four Championship game. The Coyotes (0-10-1) are the NHL’s only team without a win. They have allowed the most goals in the NHL (4.36 per game) while scoring 2.36 goals per game, which ranks 26th. They are coming off a 4-3 loss in New Jersey on Saturday night, surrendering a 3-2 lead in the third period on two power-play goals. “I thought the guys played great, they deserved to win,” first-year Coyotes coach Rick Tocchet. “When things go bad, you get two calls against you and the Devils have a great power play. … One of the biggest things that plagues our team is when the pressure is on, someone makes an ill-advised play. 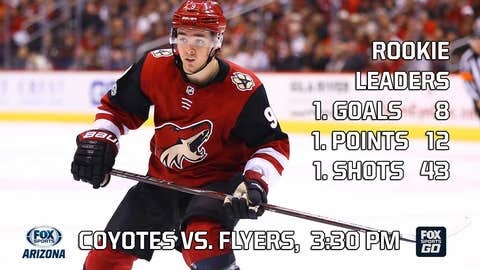 Rookie Clayton Keller’s eight goals represent 31 percent of Arizona’s offense. Keller is tied for fourth in the NHL in goals, trailing only Tampa Bay’s Nikita Kucherov (12), Washington’s Alex Ovechkin (10) and the Islanders’ John Taveras (9). Philadelphia defenseman Shayne Gostisbehere, who leads all NHL defensemen with 13 points, is questionable for Monday night’s game with an upper-body injury. He was checked from behind into the glass by Toronto’s Leo Komarov in the second period of Flyers’ 4-2 win on Saturday night. He played one more shift after the hit, which was not penalized, and did not return for the third period. The Flyers (6-5-0) already are without defenseman Andrew MacDonald (lower-body injury) for at least three more weeks and they returned from Toronto with just five healthy defensemen.